Now that my husband is back, I have some time to get back to my "How to" series. This is something I've posted about before, but I thought I'd revisit because it's been a while. Croutons are great additions to salads and blended soups, among other things, but until I lived in France and had about a million half-baguettes left over, I didn't realize how easy croutons are to make. You can use any bread, and in fact, I encourage you to try out different types. I've used anything from leftover baguettes to homemade sourdough to regular ol' bread slices from the grocery store. Whatever you use, I guarantee the croutons will be a thousand times better than the ones you buy in a box at the store. 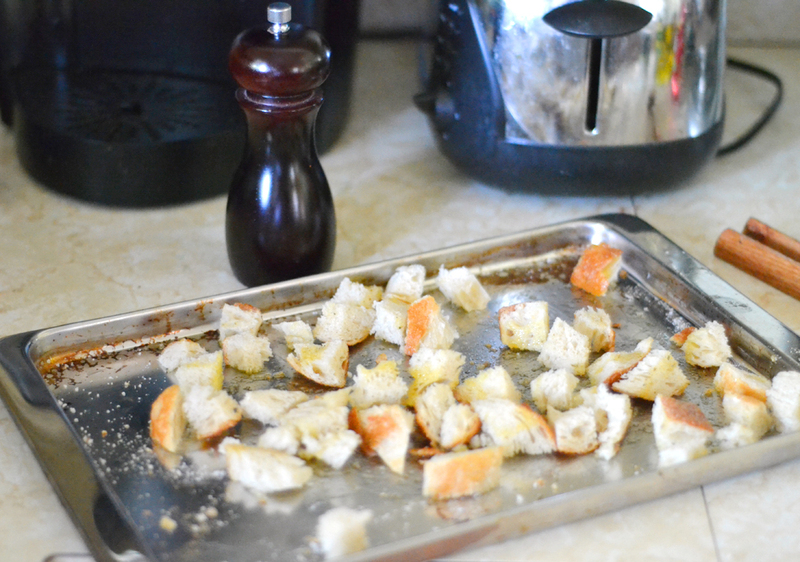 To make croutons, you need to first cut your bread into small cubes. Use as much bread is needed for your salad, etc. You can place them in a bowl or just prepare them on the cookie sheet (my preferred method since I hate doing dishes). Pour just enough olive oil on them to create a light coating on all of the bread pieces. Don't worry if every nook and cranny isn't covered--it won't matter. Add seasonings to the bread--my favorite is a generous dash of flavored salt and some pepper, but you can add dried herbs to fit your meal. Make sure that the bread is spread evenly in one layer on a cookie sheet, put it in a 350 degree oven for about 5-7 minutes. Flip the croutons and bake for a few minutes more until they are golden brown. Let them cool, and serve! You can also keep these in a plastic baggie for a few days in a cool, dry place to use later. Combine the tomato, basil and shallot in a bowl. Add a glug of olive oil (a couple of tablespoons should suffice) and a splash of vinegar (1-2 teaspoons). Salt and pepper to taste. Stir gently and set aside until you are ready to serve. Add the croutons at the last minute. They will soak up all of those delicious juices, but you don't want them to get too soggy before you serve the salad! I love homemade croutons - I usually make mine with herbes de Provence. Soooo good. 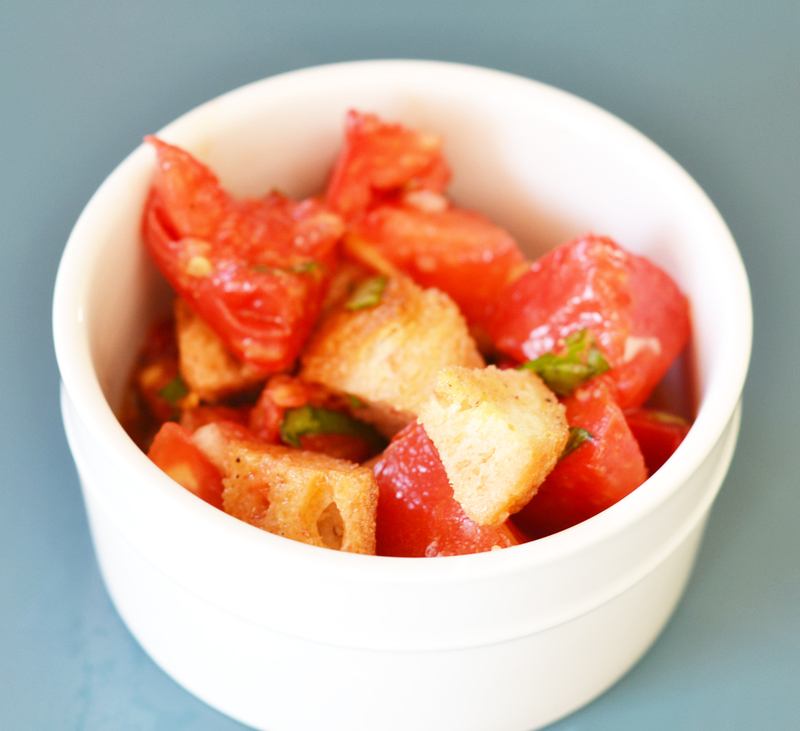 And this panzanella is perfect for a bountiful tomato harvest. I have seen SO many panzanella recipes recently. Its starting to call out to me! Mindy I am SUCH a fan of reusing items that go bad! I have never heard of panzanella but it kind of reminds me of brushetta! This is a cute presentation too I love the bowls! Becka, it's such an easy salad with so much flavor...once you try it, it will be on your menu all summer! Amy and Tiffanie, it's kind of like a bruschetta, but with more tomatoes and less bread. :-) I got some different small bowls the other day for really cheap at Pier One!